Julie Byrne hits the ball. The junior won both her singles matches in the Cats’ Big Ten defeats this weekend. After losing two matches last weekend to Michigan and Michigan State to crush their chances for a Big Ten regular season title, Northwestern dropped another two matches to conference opponents this weekend. The Wildcats (11-9, 5-4 Big Ten) lost to Minnesota 4-3 on the road Friday and then to Wisconsin 4-3 two days later. This is the first time in at least 20 years that NU has lost four matches in a row to Big Ten opponents. Coach Claire Pollard said after the loss to the Spartans that she believed a change of environment would help the Cats get back on track. 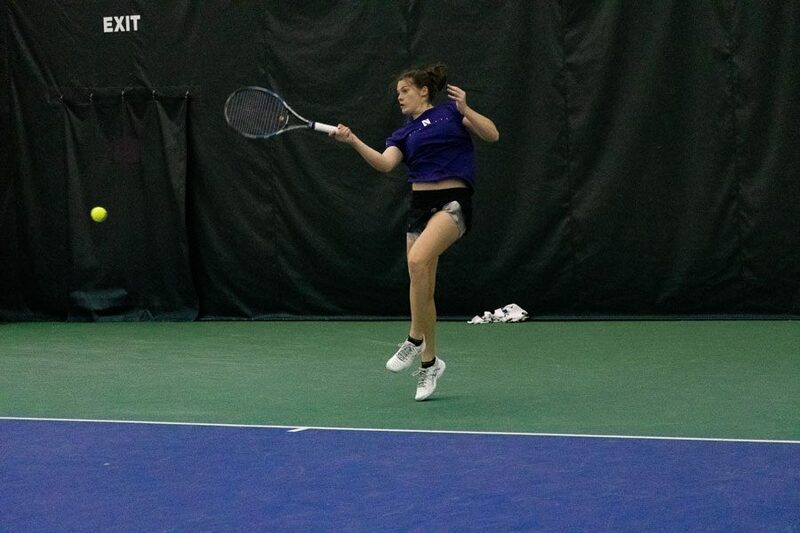 She immediately took advantage of the opportunity by changing up the doubles lineups in NU’s first match against the Golden Gophers (11-10, 4-5). Freshman Hannah McColgan and junior Julie Byrne played first doubles against Minnesota. The 47th-ranked pairing of freshman Clarissa Hand and senior Lee Or — which had played 17 matches at first doubles before Friday — split, Hand playing at second with senior Rheeya Doshi and Or at third doubles with sophomore Inci Ogut. The Cats won the doubles point but struggled in singles. Byrne and Or each won in two sets, but Hand lost at first singles. The Golden Gophers took three additional points from singles play, and claimed just their second ranked win of the season. Two days later, NU traveled down I-94 to Madison to face the 47th-ranked Badgers (15-4, 7-2), a program it had not lost to since 1998. The Cats lost the doubles point and fell in an early hole. Or lost quickly in straight sets — the first individual match she’d lost since March 1 — to even up the total score. Pozo won the first set of her singles match, but then dropped the next two sets for her fourth consecutive Big Ten defeat. Hand took her match against No. 63 Sara Castellano to three sets and came away with her first win in three matches. The defeat was the Cats’ ninth of the season, the most since 2017. NU now sits in fifth place in the Big Ten standings, with just two regular season matches before the conference tournament starts on April 25 in Lincoln, Nebraska.